When angels step in – miracles happen! There are angels among us every day. Our Health Foundation recently received a kind letter and donation to the St. Rose Dominican Children's Miracle Network (CMN) from a patient in honor of the care he was provided in our Siena Nuclear Medicine Department. In the letter, the patient shares that he was impressed with the cleanliness of the environment and how friendly the staff was during his MRI. He also shared that he was claustrophobic and two employees truly stood out by comforting him. He credits their support with helping him get through the process. When he requested to make a donation to the charity of their choice; our staff members told him they were passionate about children and informed him that we are a Children's Miracle Network Hospital. 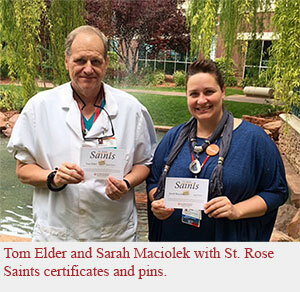 Thank you to all of the St. Rose Saints who make our patients feel safe and comforted each day! Also, a special thank you to Sarah Maciolek and Tom Elder for directing our patients to provide this gift in support of our organization!